"Does iTunes backup voicemails?" Yes - When your iPhone backs up with iTunes, your voice mails are included in the data saved to the backup. This means that precious or important voice mails are safe if anything should happen to the original on your device. To get direct access to these voicemails, you'll need to use an extraction tool. iBackup Extractor allows you to browse through your backed up voice mails and save them safely to your computer. Download and Install iBackup Extractor on your computer. Start up iBackup Extractor by double-clicking the iBackup Extractor icon on your desktop. Click the Voice Mail tab. Select the voice mails you would like to save, and click "Copy Voice Mail"
iBackup Extractor version 2.10 and higher is able to access voice mails in your iPhone backups. Click the Voicemail tab in iBackup Extractor to access and display all available voice mails from your device. Then, select which voice mails you would like to save to your computer, and hit the Copy button. 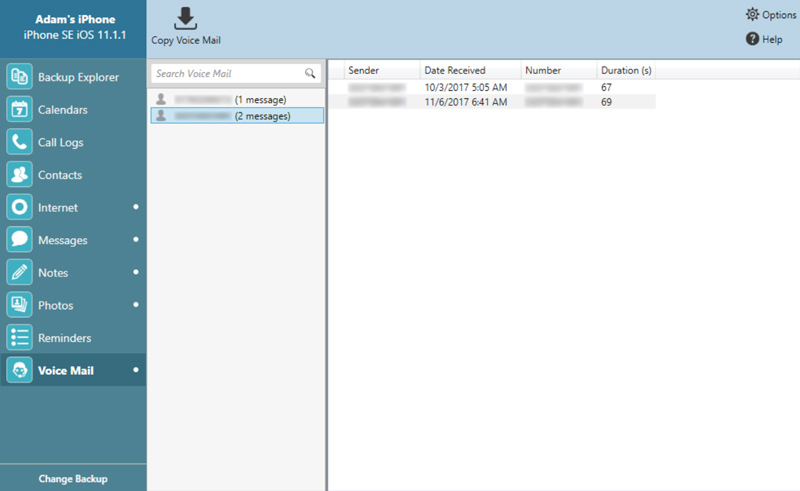 Voice Mails are saved as AMR files. Such files can only be played with certain software. If you are using a Mac, you will be able to play your voice mail files with QuickTime Player. However, if you do not have access to this software, or if you are using a Windows PC, you may need to download a free piece of software such as AMR Player, to listen to your saved voice mails.